ADVANCE TICKETS ARE NOW SOLD OUT FOR SATURDAY’S PARTY. WE’LL BE RELEASING A FEW TICKETS AT THE DOOR, BUT THEY’LL GO FAST. DEFINITELY ARRIVE EARLY IF YOU DON’T HAVE A TICKET AND WANT TO GET IN. WE’RE LOOKING FORWARD TO SEEING YOU! The Mayan calendar is about to end, and Quetzalcoatl is coming back on a raft of snakes to either a) bring destruction upon all the Earth or b) elevate the consciousness of humanity. (Or nothing will happen.) 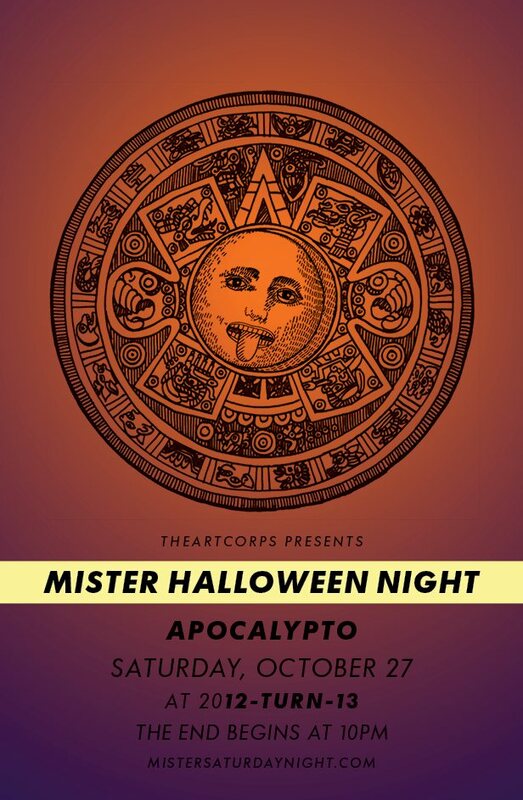 No matter what, we bring you Mister Halloween Night: Apocalypto, a run down of what to do when the real apocalypse happens. Our favorite loft, 12-turn-13, is being transformed into 2012-turn-13, a temple dedicated to ancient, yet timeless rituals like dancing and dressing up in ridiculous but painstakingly detailed costumes. Shamans Eamon Harkin and Justin Carter will utter incantations, mystical forms will be conjured by the High Priest of The Sense Society, and creatures from the underworld, EnSubtitles, will rise for a but a few moments to perform a transformational ceremony. Apocalyptic outfits will be rewarded with an on-the-house drink. We are equal opportunity apocalypsers, so don’t feel limited to Maya. Think giant asteroid, dinosaur extinction (there’s got to be a good Barney The Dinosaur costume in here somewhere), alien attack, ice age or rapture. If you need some inspiration, remember the great apocalyptic films: The War of the Worlds, Dr. Strangelove, Night of the Living Dead, Planet of the Apes, Mad Max. Remember, group costumes please the gods and not dressing up at all angers them.Speaking of the End, it’s also the last Mister Sunday of the season. We never know from year to year if we’ll be able to come back to the Gowanus again, so every closing party is particularly special. This year that’s doubly true, as it’s been the best season we’ve ever had. We’ll work hard to bring Mister Sunday back to Gowanus Grove or some other equally special place next year, but today, we’re going to focus on soaking in those last rays of sunshine on the dancefloor under the poplars. 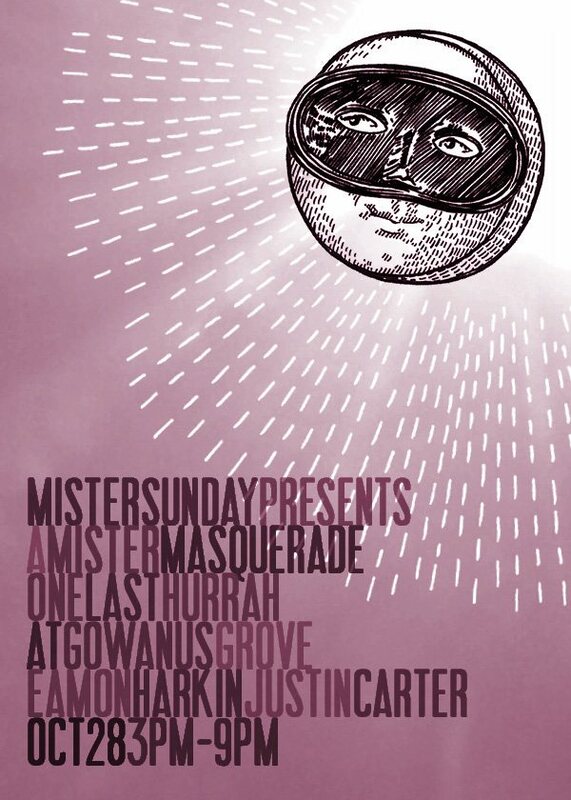 In honor of Halloween, our closing party is doubling as a Mister Masquerade. We’ll have some Halloween happenings for the young folk, and we’ll have mulled wine at the bar for the grown-ups. And if you wear a costume, you’re in for $10 whether you show up before or after 5pm. Purchasing tickets ahead of time is always highly encouraged (especially for this Saturday), so to guarantee your entry, please pick one up here. As always, you can RSVP to both parties at mister@mistersaturdaynight.com for reduced entry before 12am (Saturday) and 5pm (Sunday), as long as there’s space available.